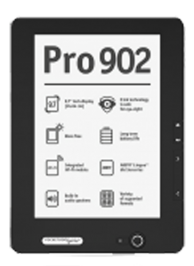 E-Ink technology makes reading with PocketBook Pro 902 much like reading an ink on paper book. The screen supports 16 shades of gray in reflecting light to display texts and illustrations. E-Ink technology decreases potential eyestrain as it provides more stable images than flickering, conventional, flat panel displays. PocketBook Pro 902 offers a wide viewing angle and because the screen does not use backlight, it can be used in bright sunlight without images appearing to fade. As a set-up option, refresh without darkening the screen. A single battery charge provides PocketBook Pro 902 with enough power to read 20 standard books, about 7000 page turns, or a month of two hours of daily reading without recharging. Go online using PocketBook Pro 902. It will connect to the Web anywhere Wi-Fi is available, and will display all Internet pages suitable for E-Ink screens. PocketBook 602 connects to Bluetooth support devices, such PCs and cell phones (for Internet connectivity and file transfer). Your new PocketBook e-reader has two gigabytes of internal memory of which 860 Mb is taken by the system and 1,140 Mb is available for your storage, enabling storage for 3,000 e-books. Also, external microSD and microSDHC memory cards support up to 32 gigabytes. New model PocketBook e-readers feature adapted Adobe software to support e-books with DRM (EPUB and PDF files with copyright protection). An MP3 player is built into PocketBook Pro 902. Listen to an audio-book or read while listening to your favorite music. You can begin to use your e-reader right away. All essential functions are factory installed so there is no need for a computer or additional software. PocketBook International strives to improve its products. Upgrades are issued quarterly and are easy to install. New firmware features a main menu able to customize functions to reflect an individual reader’s usage and preferences. Enter an author’s name or book title and your e-reader displays all e-books related to the inquiry. PocketBook Pro 902 is equipped with a thousand free books. Additionally, more than 30,000 free, public domain books available at www.BookLand.net can be downloaded in 59 languages. PocketBook is the first e-reader with the capacity to support text-to-speech in 26 languages. Mark text of interest to revisit or highlight a passage and copy it to your notes list. There is no limit to the number of notes and bookmarks you can create. Open an e-book’s table of contents and the bookmarks and notes that you have created will be displayed.